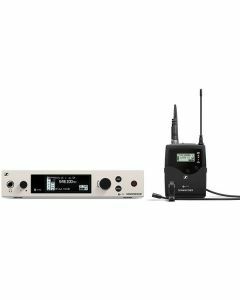 True diversity half-rack receiver in a full-metal housing with intuitive OLED display for full control - features SK 500 G4 wireless bodypack transmitter, EM 300-500 G4 receiver and MKE 2 Clip on Microphone with omni-directional pick-up pattern. The pro‘s choice. Renowned sound engineers rely on ew 500 G4‘s flexibility, especially when handling multi channel settings on the world‘s music stages. Up to 88 MHz bandwidth, up to 32 channels. Ethernet connection for Wireless Systems Manager (WSM) control software included for advanced frequency coordination in multi channel setups. The pro‘s choice for impressive presentations. The professional MKE 2 Gold omni-directional condenser microphone resists the test of time on any big live stage and ensures a high speech intelligibility on any stage, indoors and outdoors. On a live stage in your favorite venue or at major festivals. In houses of worship, and in the theater. Sound engineers and avid users love its flexibility and versatility whereas more casual users will adore how easy it is to setup, allowing them to fully concentrate on their main goal: connecting with their audience. Renowned sound engineers rely on ew 500 G4's flexibility, especially when handling multi-channel settings on the world's music stages. Up to 88 MHz bandwidth, up to 32 channels. Ethernet connection for Wireless Systems Manager (WSM) control software included for advanced frequency coordination in multi-channel setups.